With the help of a new method called "dual-electrode photoelectrochemistry," University of Oregon scientists have provided new insight into how solar water-splitting cells work. An important and overlooked parameter, they report, is the ion-permeability of electrocatalysts used in water-splitting devices. Their discovery could help replace a trial-and-error approach to paring electrocatalysts with semiconductors with an efficient method for using sunlight to separate hydrogen and oxygen from water to generate renewable energy, says Shannon W. Boettcher, professor of chemistry and head of the Solar Materials and Electrochemistry Laboratory in the UO's Materials Science Institute. The research is described in a paper placed online Dec. 1 in advance of regular publication in the journal Nature Materials. Solar water-splitting cells, which mimic photosynthesis, require at least two different types of materials: a semiconductor that absorbs sunlight and generates excited electrons and an electrocatalyst, typically a very thin film of a metal oxide that contains elements such as nickel, iron and oxygen, which serves to accelerate the rate at which electrons move on and off water molecules that are getting split into hydrogen and oxygen. "We developed a new way to study the flow of electrons at the interface between semiconductors and electrocatalysts," Boettcher said. "We fabricated devices which have separate metal contacts to the semiconductor and electrocatalyst." To do so, lead author Fuding Lin, a postdoctoral researcher, electrically contacted a single-crystal of semiconducting titanium dioxide and coated it with various electrocatalyst films. A film of gold only 10 nanometers thick was used to electrically contact the top of the electrocatalysts. Both contacts were used as probes to independently monitor and control the voltage and current at semiconductor-electrocatalyst junctions with a device known as a bipotentiostat. Lin focused on oxygen-evolution reaction the most difficult and inefficient step in the water-splitting process. "This experiment allowed us to watch charge accumulate in the catalyst and change the catalyst's voltage," Boettcher said. It turns out, Lin said, that a thin layer of ion-porous electrocatalyst material works best, because the properties of the interface with the semiconductor adapt during operation as the charges excited by sunlight flow from the semiconductor onto the catalyst. The research was designed to understand how maximum energy might be extracted from excited electrons in a semiconductor when the electrons enter the catalyst, where a chemical reaction separates oxygen and hydrogen. To date, Lin said, researchers have been experimenting with materials for creating efficient and cost-effective devices, but minimizing the energy loss associated with the catalyst-semiconductor interface has been a major hurdle. In the study, Lin compared the movement of electrons between semiconductors coated with porous nickel oxyhydroxide a film previously shown by Boettcher's lab to yield excellent electrocatalytic efficiency for separating oxygen from water with semiconductors modified with non-permeable films of iridium oxide. 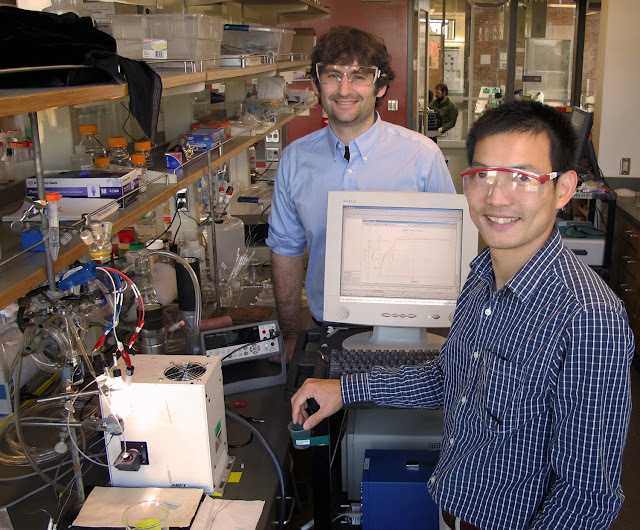 "The ion porous material allows water and ions to permeate the catalyst material," Lin said. "When these catalysts are in solution the catalyst's energy can move up and down as its oxidation state changes." Catalysts with non-porous structures in semiconductor-catalytic junctions don't show this behavior and typically don't work as well, said Boettcher, who also is a member of Oregon BEST (Oregon Built Environment & Sustainable Technologies Center), a state signature initiative. Converting sunlight into energy and storing it for later use in an economically viable way is a major challenge in the quest to replace fossil fuels with renewable energy. Traditional solar photovoltaic cells absorb sunlight to form excited electrons that are funneled into wires as electricity but storing energy as electricity, for example in batteries, is expensive. Details about how excited electrons move from semiconductors to catalysts have been poorly understood, Boettcher said. "This lack of understanding makes improving water-splitting devices difficult, as researchers have been relying on trial-and-error instead of rational design." The system used in the study, Boettcher added, was not efficient. "That wasn't our goal," he said. "We wanted to understand what's happening at a basic level with well-defined materials. This will facilitate the design of systems that are more efficient using other materials." "Researchers at the University of Oregon are reengineering the science, manufacturing and business processes related to critical products," said Kimberly Andrews Espy, vice president for research and innovation and dean of the UO Graduate School. "This important discovery by Dr. Boettcher and his team could lead to more efficient systems that help foster a sustainable future."